Francis Wayland Dunn was born 29 January 1843 in Wayne, Astabula Co., Ohio, to Ransom Dunn, a minister and missionary of the Free Will Baptist faith. 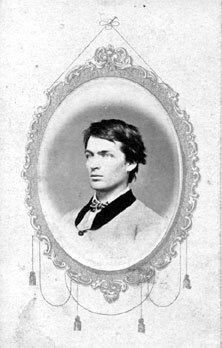 Francis and his brother, Newell Ransom Dunn, both enlisted in the 64th Illinois Infantry on 28 August 1862 in Freedom, IL and mustered in 28 August 1862 at Springfield, IL. Newell died 26 March 1863. Wayland sirvived the war and taught at Hillsdale College where his father was president. Wayland died in his sleep on 13 December 1874 Just before he reached the age of 32. Picture submitted by Hillsdale College.